fantasy art and tree chatter of aquariann: Treasury Tuesday: Supermoon Sunday Night! Treasury Tuesday: Supermoon Sunday Night! Wasn't August's full moon magnificent? If you missed the biggest supermoon of 2014, Laura from Chicken Jungle captured its beauty during last weekend's SPS team game. 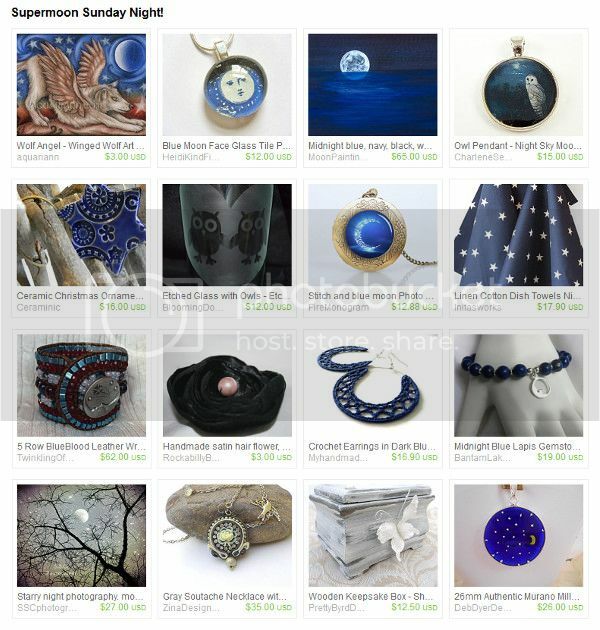 Her moon gift ideas include blue moon locket necklace by Fire Monogram, starry night photo print by S.S.C. Photography and my winged wolf art magnet. What new Etsy treasuries or Artfire collections have you curated or been featured in this week? Enter them into the Magical Linky below by typing the title of the treasury into the "Your Name" box, then pasting the treasury link into the "Your URL" box. NOTE: If you miss these instructions the first time and type in your real name instead of the treasury's name, don't fear! I'll fix it as soon as possible. The only rule to participate is to click and comment on at least as many treasuries as you list, starting with the one immediately in front of your additions and moving on to the other themes that intrigue you. Adding the button below to your blog and using the social media icons at the bottom of this post to share this list with your friends and followers would also be wildly appreciated. The more, the merrier! This Linky is ongoing, so come back to share and browse more treasuries any time! My dragon will guard them well. I love your blog - it's magical! I will have to explore it. Thanks so much for featuring my Supermoon treasury. (This is Laura from Chicken Jungle! Very pretty, I love this treasury!